Myth and archetypes permeate both modern and ancient literature. In some modern literature, however, use of such symbols can result in a reversal of their traditional meanings. In Gilman’s “The Yellow Wallpaper,” the narrator’s journey to madness as a result of her improper psychiatric treatment is marked by the use of the archetypal theme of the terrible mother and the soul mate, and mythological symbols such as color, eyes, doorways, labyrinths, and the descent into the underworld. “The Yellow Wallpaper,” features a nameless narrator oppressed by the psychiatric treatment from her scientist husband John. Though well-meaning and loving, John is nonetheless the reason for the narrator’s later fall into madness. The narrator states how John “ does not believe I am sick…nothing the matter but temporary nervous depression,” and prescribes his wife to be “absolutely forbidden to ‘work’” (Gilman).The narrator is not allowed to write anything and the entire story is written as the narrator’s secret journal, as John “hates to have me [her] write a word”( Gilman). John does not even allow the narrator to choose her own bedroom, insisting upon using the attic with “windows … barred for little children, and… rings and things in the walls” like a room made to be a prison (Gilman). The narrator is treated like a child by John, with him calling her such things as “little girl,” and “blessed little goose” and not listening to the narrator when she complains of the wallpaper in her room (Gilman). John ignoring the narrator and insisting on his non-activity treatment eventually leads to the narrator’s insanity, who becomes obsessed with the yellow wallpaper in her room. 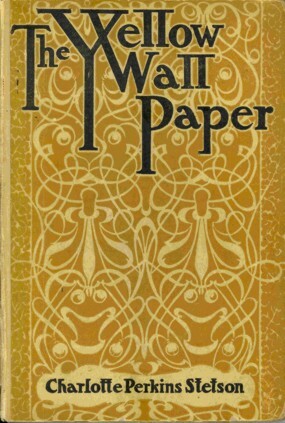 The narrator’s descriptions begin to become shorter, and less complex, as she spends more time with the wallpaper as “It dwells in my mind so!” (Gilman). The downward spiral begins to fall faster for the narrator as she now sees the wallpaper as “bars” for “the woman behind” it (Gilman). The narrator becomes more paranoid about her family, suspecting John of “looking at the paper” and of John’s sister to be trying to spy upon her. It is at this stage of noticing the “creeping” women in the wallpaper that the narrator loses touch with outside reality and now begins to associate more with the woman in the paper who is now “all the time trying to climb through,”( Gilman). The narrator is now becoming her dark self, the woman in the walls, when the narrator describes how “ I pulled and she shook, I shook and she pulled, and before morning we had peeled off yards of that paper,” (Gilman). The narrator’s loyalty is now to her mad counterpart in the wall and not to her family. The chilling last part of the story proves how the narrator has completely become her shadowy self in the walls as she proclaims “I’ve got out at last… And I’ve pulled off most of the paper, so you can’t put me back!”(Gilman). The narrator is the woman in the wallpaper, who must “creep” through the “bars” of her domestic prison no longer, and is finally free. The narrator is the archetypal women, however Gilman has her transcends from the soul mate figure to that of terrible mother in an interesting reversal of the male expectation of the ‘positive’ aspects of female nature. The narrator is described by John in the beginning of the story as “blessed little goose” and is treated by John “very careful[ly] and loving[ly], and hardly lets me stir without special direction,” (Gilman). This reflects the soul mate figure, that of “the Sofia figure, Holy Mother, the princess or beautiful lady,” (Guerin). As the narrator slowly becomes the women in the wallpaper, she unleashes the terrible mother part within herself, of “witch, siren…associated with sensuality…fear, danger…the unconscious in its terrifying aspects,” (Guerin). However, Gilman does not stick to the traditional male belief of the terrible mother being the symbol of death, as by freeing herself from the social prison of being the soul mate, the narrator has gained a greater understanding of her inner consciousness. The yellow color of the wallpaper has several archetypal meanings. Yellow is often associated with the sun, which has symbolic meanings of creative energy, consciousness, and enlightenment (Guerin). However, Gilman has taken the positive aspects and turned it on its head. The narrator does indeed show more tendencies toward creative energy and consciousness, but only in that she focuses her awareness towards her inner dark conscious, the women in the wallpaper. The energy has become unhealthy and perverted, mirrored by the narrator’s description of “a smoldering unclean yellow… dull yet lurid orange in some places, a sickly sulphur tint,” (Gilman). The image of fire in the words “smoldering” and the use of the word “sulphur” is symbolic of how fire is both knowledge (as in the Greek myth of Prometheus) and representative of the Christian hellfire. Both of these connotations reflect the dual nature of the narrator as the terrible mother and the soul mate. The narrator’s descent into madness is marked by the symbols of eyes, labyrinths, and the descent into the underworld. A dark paranoia occurs when the narrator starts to see “two bulbous eyes” and a “kind of sub-pattern… strange, provoking, formless sort of figure” in the yellow walls (Gilman). The narrator exclaims over “ those absurd, unblinking eyes … everywhere”( Gilman). The numerous “eyes” in the maze of the in the wallpaper is reminiscent of the Sumerian myth “Descent of Inanna” in which the character Inanna descends into the underworld through a labyrinth to find the Goddess of the Sumerian underworld, her sister Ereshkigal, who places the “eye of death” upon her (Smith). The archetype of the “evil eye” can be found in numerous religions such as Judaism Islam, and Christianity, as well as in the Greek myth of Medusa, whose stare would turn anything into stone. The stare of the evil eye also is associated with a reduction in fertility, an interesting parallel in that the narrator in “The Yellow Wallpaper,” cannot take care of her newborn baby as she “ cannot be with him, it makes me[her] so nervous,” and instead has a nanny take care of the baby (Gilman). The symbol of the wallpaper mirrors that of the mythological labyrinth. The narrator must journey through the wallpaper as she would a labyrinth, as she has to “follow the lame uncertain curves for a little distance” before the lines of the wallpaper “suddenly commit suicide… outrageous angles,[that] destroy themselves in unheard of contradictions,”(Gilman). The most famous myth involving a labyrinth is that of Theseus and the Minotaur, the half- bull half- man monster in the center of the Cretan Labyrinth that Theseus defeats, and Theseus safely leaves the maze with the help of a ball of twine. Of course, the narrator has no life-line to tether her from becoming lost in the labyrinth of her own mind, and instead sinks further into the madness of the terrible mother. Another symbol Gilman uses is that of doors. As the narrator becomes more tangled into the “sub-pattern” of the labyrinth wallpaper, she becomes trapped by her efforts to free her terrible mother self in the walls. When her husband arrives on the day of their departure, she says, “I have locked the door,” (Gilman). He calls for his sister to bring an axe “to break down the beautiful door” and says, “very quietly … ‘Open the door, my darling! '” (Gilman). The narrator tells him that there is a key “by the front door,” and, when he finds it and enters the room, he stops “short by the door,” and faints at the sight of his wife “creeping” on the floor (Gilman). The use of the word door six times in one passage revels Gilman’s stress of this archetypal symbol of doorways, as well as emphasizing the link between doorways, the maze, and the descent into the underworld. The final archetypal image is that of the hero’s descent into the land of the dead, the underworld. The narrator, in an inversion of the heroine archetypal journey, enters the dark underworld of her own mind and undergoes a quest in which she must free the women behind the wallpaper. During this time, the narrator experiences the stages of the heroine’s journey, including separation from her family, transformation into the terrible mother, and her return in the final passage of the story. However, the narrator does not become the archetypal scapegoat in that she must die to atone for people’s sins, but her soul mate sane self dies instead. Mythological and archetypal symbols such as eyes, doors, labyrinths, and color can be found in Gilman’s “The Yellow Wallpaper”, as well as the archetypal women, the soul mate and the terrible mother. This dark re-telling of traditional themes warns against the improper treatment of mental disorders. Gilman’s work remains widely popular today. Gilman, Charlotte . “The Yellow Wallpaper.” College of Staten Island Library. Web. 10/10/2011. Guerin, Wilfred, et al. A Handbook of Critical Approaches to Literature. New York: Oxford University Press, 2011. Smith, Landsing. “Myths of Poesis, Hermeneusis, and Psychogenesis: Hoffmann, Tagore, and Gilman.” Studies in Short Fiction: Spring. 1997: 227-237.